"Each of us is carving a stone, erecting a column, or cutting a piece of stained glass in the construction of something much bigger than ourselves." As the currents of time pass over ancient nations, leaders emerge with a simple goal: to create something grand that will outlive them and work towards a better tomorrow. From humble origins, these individuals strive to advance and build the greatest nation in the world. And now, you can join them. 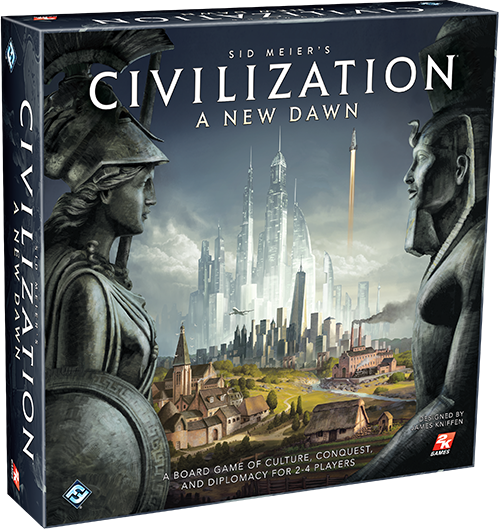 Fantasy Flight Games is proud to announce Sid Meier’s Civilization: A New Dawn! Rewrite history, forge your destiny, and take your place among the most influential icons to ever walk to the earth as the founder of a new age. 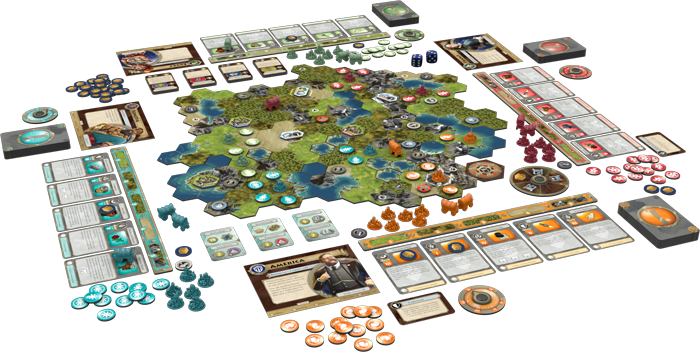 Sid Meier’s Civilization: A New Dawn is a strategy board game in which two to four players act as the rulers of history’s most memorable empires. Over the course of the game, players will expand their domains, gain new technologies, and build many of humanity’s greatest wonders. In the end, one nation will rise above all others to leave its indelible mark upon history. Before players begin their mission to rewrite history, they must each select the leader they will embody for the duration of the game. 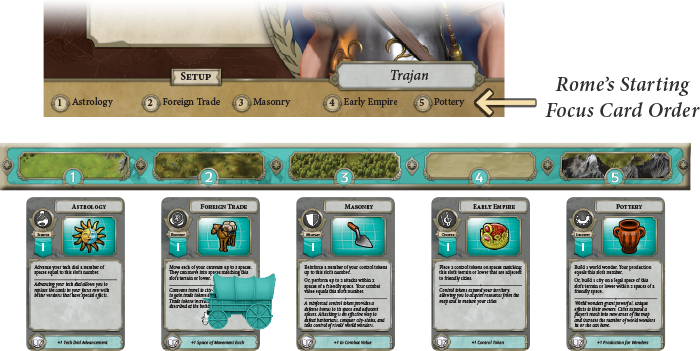 Players may become the Roman emperor Trajan, the Aztec’s warrior Montezuma, France’s Catherine de Medici, and many more, each with their own unique abilities that help you shape the world along specific ideologies. Once equipped with their leaders’ tools and missions, players are ready to build a nation like none the world has ever seen! Sid Meier’s Civilization: A New Dawn is played over a series of turns that take players from ancient history to the present day. As the wheel of time turns, leaders build their nations from single cities to sprawling empires filled with wonders and technology. As leaders explore the world, their nation can develop and flourish through accomplishments such as scientific advancements, cultural developments, and military production. Each player has a series of five focus cards, one for each area of advancement, that shift as a player takes turns to represent the investment of time. A card resolved in the fifth slot has a greater impact than a card resolved in the first slot, as more time was spent developing that pursuit. Leaders must prioritize and balance their nation’s goals, weighing the value of any given pursuit against the time needed to accomplish it and know when to resolve a card for its maximum effect. While leaders attempt to raise their civilizations to prominence, they must also confront world events such as barbarian attacks. These roving ravagers can destroy caravans to wreck a nation’s economy, or lay low an unfortified city. Fate favors the well prepared and players may quickly learn that a diversified nation is better equipped to withstand the attacks of outside assailants. If leaders are not prepared for these often unpredictable obstacles, their civilization can crumble into dust and be swept away by the currents of time. A New Dawn stays true to its origins in the Sid Meier’s Civilization video game series by challenging players with tactical decisions for how they plan to take over the world. Do they wish to become the world’s richest nation, harvesting resources and trading with allies? Or perhaps they prefer to rule through military conquest, trampling their rivals into the dust? 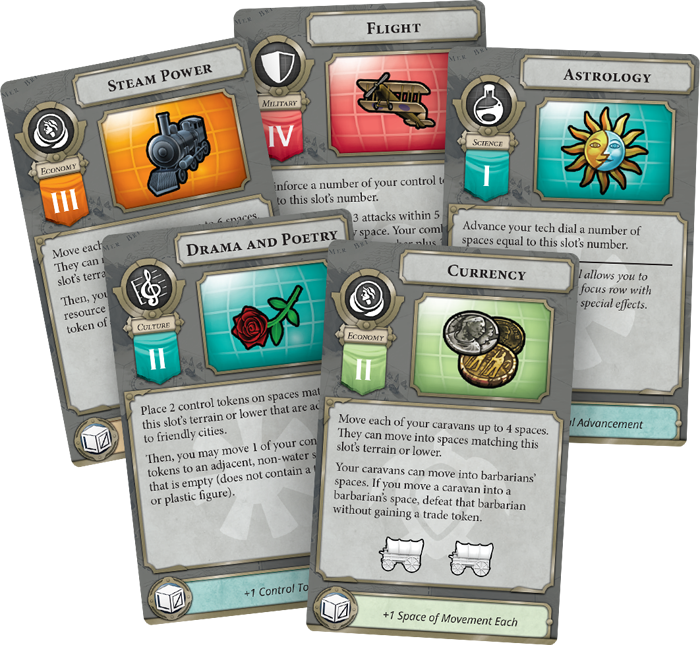 The areas in which players can gain power and influence are defined with five focus card types: culture lets players expand their territory and claim resources, science allows players to discover new technologies, economy enables players to interact with city-states and rival cities, industry allows players to build cities and world wonders, and military allows players to either reinforce defenses or perform attacks. While each focus is unique, they are inherently linked. For example, leaders need the resources gained through cultural pursuits in order to build cities and wonders. Meanwhile, an empire needs a strong military to defend cities and caravans from barbarian attacks, therefore safeguarding its economy. Players must strategize and diversify to ensure that their civilization thrives. But no great empire can withstand the test of time by remaining completely insular. 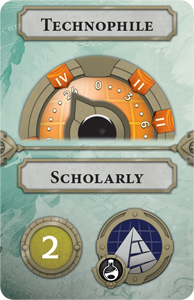 Leaders gain trade tokens by using their economy focus to send caravans to city-states and rival cities, or when the event dial’s pointer moves to the trade icon. Players may then spend trade tokens when resolving focus cards to increase their effects. For culture, a player may spread their influence beyond their borders. A military focus enhancement increases the player’s combat value. An improvement in science advances a player’s tech dial. Enhancing industry increases the player’s production if they are building a wonder. Otherwise, a trade may boost the player’s economy, allowing their caravans sent out to trade to move further. By trading with the outside world, the leaders of Civilization advance their own nation’s goals and achieve more than they ever could alone. The leaders of Sid Meier’s Civilization: A New Dawn race against one another to prove that they are the greatest nation that has ever existed. Their paths to victory may differ, but their goal is the same: to conquer the world. By achieving goals in their focus areas, players get closer to accomplishing the agendas detailed on the game’s victory cards. Each of the three victory cards is divided into two agendas, giving players six possible missions to choose from. When a player completes an agenda, that player places one of his or her control tokens next to that agenda’s victory card. More than one player may have a control token on any given victory card, but these markers cannot be removed. Even if a leader ceases to satisfy the agenda later in the game, the control token remains and they do not need to complete the agenda again. Experienced players may also choose to enforce the aptly named "epic game" rule. This offers players a longer gaming experience by including four victory cards in the game instead of three. The rules for victory remain the same: players must complete one agenda on each victory card. The first player who accomplishes this wins and may proudly look upon the civilization they have built, knowing that their people can look forward to a bright and glorious future. Build something greater than yourself. Set a new course of history and create a civilization that knows no limits! Sid Meier’s Civilization: A New Dawn (CIV01) is scheduled to hit shelves in Q4 of 2017. You can head to your local retailer to pre-order your copy today, or you can pre-order from FFG here. Designed by James Kniffen, Sid Meier's Civilization: A New Dawn is turn-based strategy game inspired by Sid Meier's classic video game series. Players act as history's most famous leaders who journey from ancient history to the modern age as they struggle to advance their civilizations in five different areas. Advance your culture, find new technology, and build wonders to shape history to your own design!